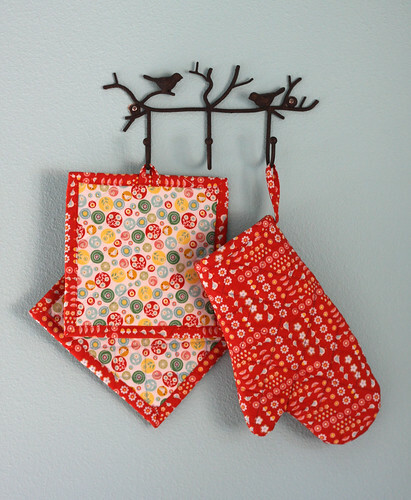 Tracy selected two fabrics for her oven mitt and hot pads from Hideaway by Lauren and Jessi Jung. Folk Art in Berry and Edelweiss in Snow. 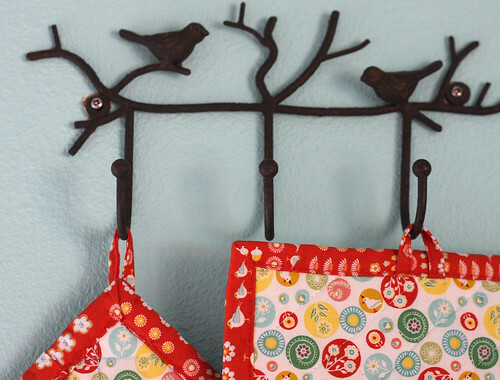 This was a fun, quick, practical project that would make a great gift. The mitt is a nice shape; the thumb isn’t really deep so it’s easy to get on and off. Self-fabric bias binding was made for the mitt. Straight of grain binding for the pads was fine. The instructions are clear and easy to follow. She followed the suggestions for quilting, marking 1.5″ diamonds, and sewed without a walking foot. The only challenge was sewing the binding on the closed edge of the mitt, when it came time to topstitch, it barely fit on the free arm of her machine. 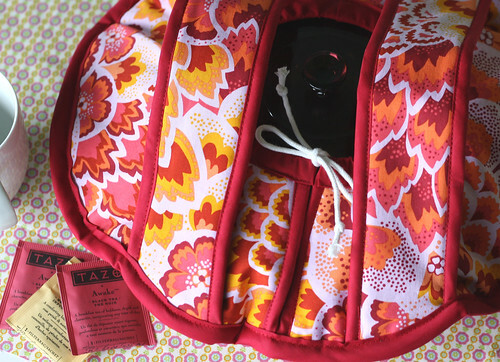 Jacqui chose a beautiful fabric from Amy Butler for her hot dish caddy. Soul Blossoms Home Decor Peacock Feathers Rose. The instructions were straightforward and the pictures made it easy to follow. Working with layers of Insul-Bright batting, use a size 18 needle. A new needle is recommended when attaching the outer binding since there are several layers of fabric and Insul-Bright batting to sew through. It is quite bulky so expect to sew slower. Prepackaged double fold bias tape was used for both sizes listed. 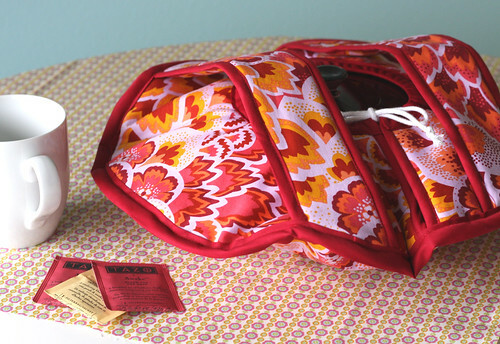 The 7/8” wide double fold bias tape was packaged as Quilt Binding. The casserole caddy turned out quite roomy for a round 2.5 quart dish. Jacqui plans to take the caddy shopping with her to pick out a bigger casserole dish. Jacqui absolutely loves the way it turned out. She won’t worry about making the best tasting dish at a potluck – the casserole caddy will steal the show!